This is a photo of our irrigation computer monitor in my office. 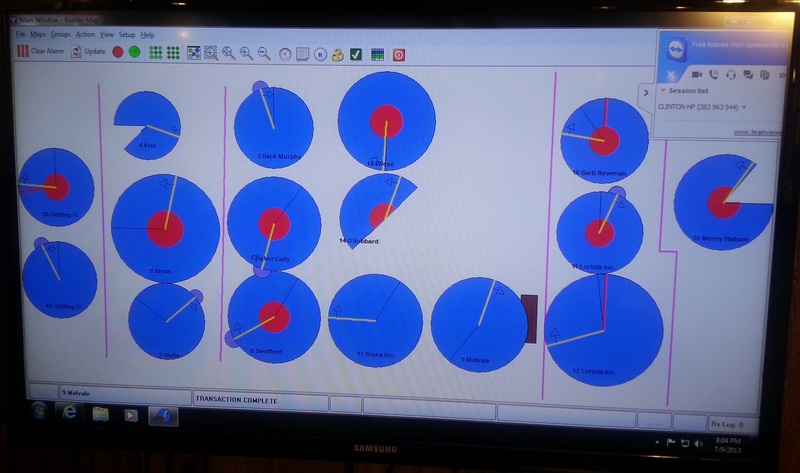 All of our systems were operating when I took the photo as indicated by the blue color. The yellow line indicates system position in the field...the black line is an access road...six units have the end gun applying water as well. 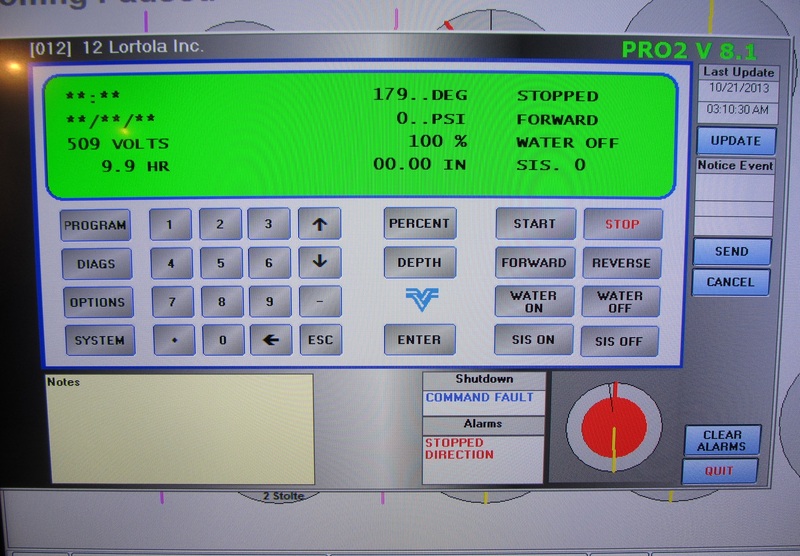 We are able to access the control panel at each pivot and can totally control the pivot from this office. We can also use our smartphones to do most instructions as well. 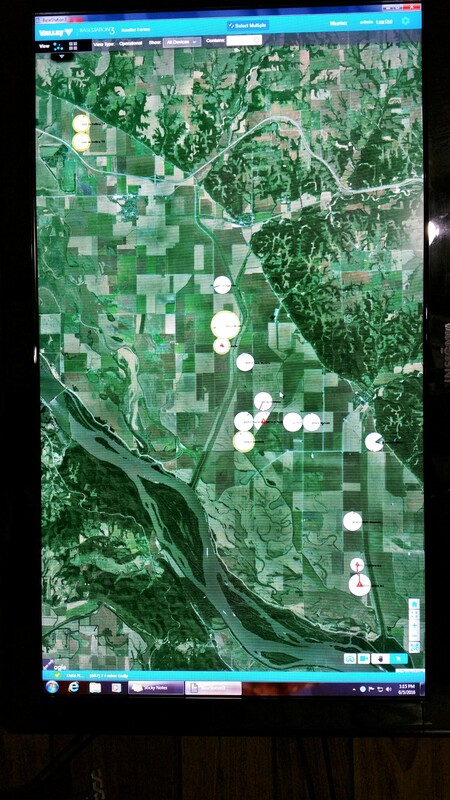 This is another view with the systems displayed on a aerial photograph of the Mississippi River Valley showing their actual locations. As you can see, we bring the folded corner arm as far as possible to allow the main system to irrigate as much crop as possible. The sprinklers along the last steerable span all have individual valves to turn them off as the arm folds in to prevent overwatering. This steerable span is guided by GPS...and uses a satellite receiver almost exactly the same as our tractor GPS units. We have numerous drainage ditches that the systems must cross. Here I am installing a 30 inch diameter by 20 feet long tube for a crossing. This system has 8 towers and each must cross this drain twice...once here and again on the other end of the field. I often use 40 feet long tubes for the corner arms so we can also use them for an equipment crossing. We apply nitrogen fertilizer solution through the system...usually two applications...and considering adding some micronutrients as well. Pretty much all systems now are low pressure and use drops to lower the sprinklers down into the crop canopy to reduce evaporation and protect the health of the plant leaves. It is not common for us to irrigate when our corn is this short. 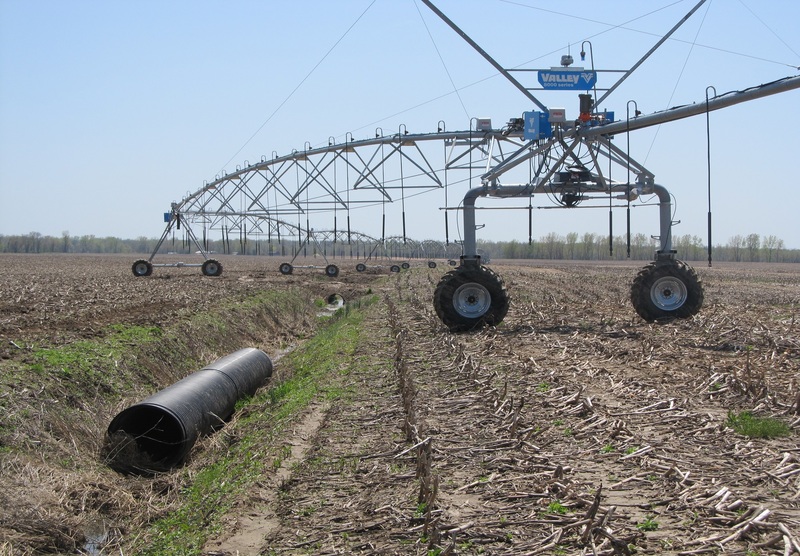 We bought our first system in 1977, a Valley water drive unit, that we towed back and forth between two pivots. This was quickly followed by two more, a Valley electric and a Lindsay Zimmatic. Then in a few years, by a Valley corner system in 1982. Our wells are approximately 80 feet deep and the initial boring diameter of 36 inches. 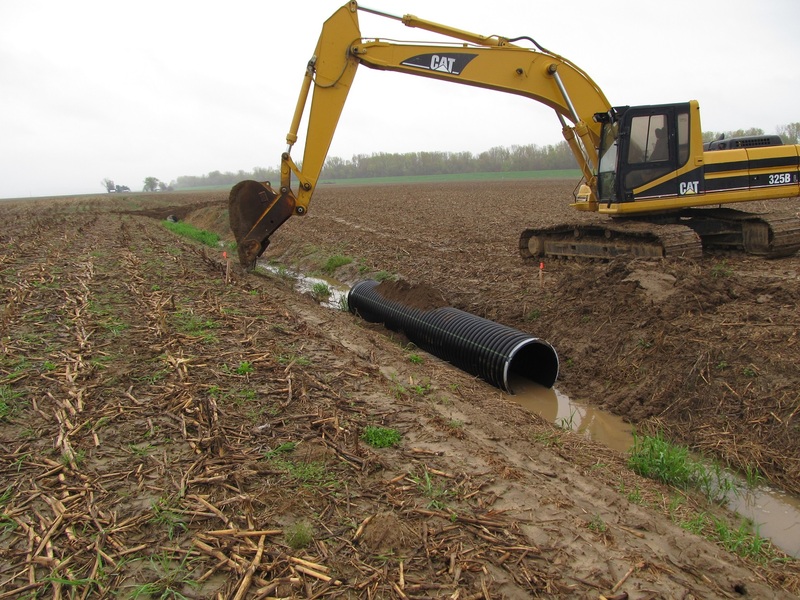 Next, 80 feet of 14 inch pipe with the lower one-half slotted is centered in the bore and fine gravel fills all around it. A submergible pump is lowered into the well and an electric motor sits on top...usually 50 hp or less. Having a great water supply that is relatively shallow is a real asset. That is because we are in a major river valley where sand and gravel underlay our top 15 feet of soils.